You can take your dog to obedience school; you can watch all the dog training videos and read all the books; but there is no substitute for simply walking your dog. I have done all of the above with mixed success, but only in my recent readings have I seen the virtues of dog walking stressed, especially for a high-energy, working breed such as mine. And I have paid attention. Exercise: The number one benefit, of course, is that walking provides exercise for both dog and owner. The main reason I got a dog was to force myself to walk. Somewhere in my dog’s puppyhood I lost sight of that goal, mostly due to the horrible winter we had this past year. I just couldn’t see a dog of only a few months out in the ice and snow and freezing temperatures. I think it would have been different if we had gotten her in the spring. But I took too long to get into the habit of regular walks and relied too heavily on a fenced in backyard and a Frisbee to work the dog out. Long walks were special occasions, but no longer. As I write this, Suki is conked-out at my feet after an hour-long morning walk that included some Frisbee play on the Antioch Golf Course – ah, play, another benefit. 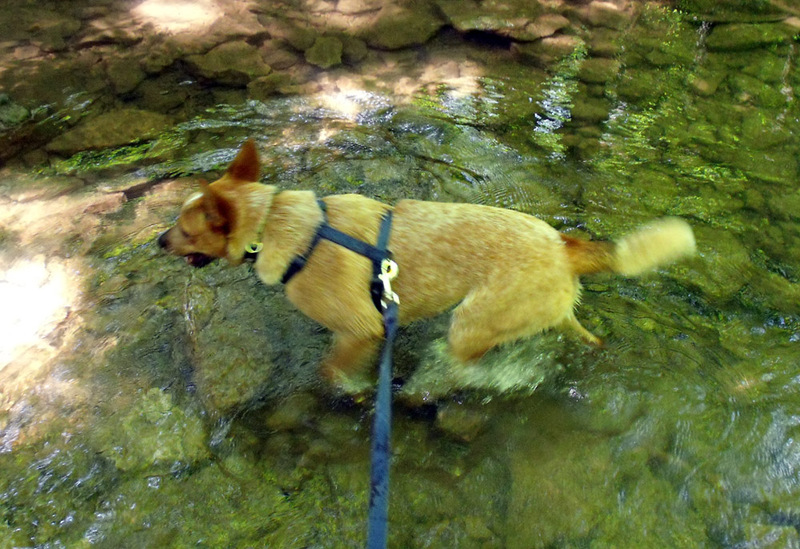 Discipline: Walking together provides lots of opportunities to teach your dog discipline. First comes the loose-leash training; after which come the life lessons. I talk to Suki constantly while we walk. She doesn’t understand a lot of what I am saying, but it keeps her aware of my location in relation to her. I often tell her, “Walk with Daddy.” She seems to know what that means. Whenever she does something right, such as letting a skateboarder or bicyclist slip by without trying to take off their wheels, I heap on the praise. This also applies to her not barking at deer, squirrels, skunks, you name it. Lately, we have encountered families of deer almost every time we've gone out. She will stand or sit quietly as they go by. I am always surprised that the herding instinct hasn’t kicked in, but it seems like the praise I give her afterward has really had an effect. Affection: Walking your dog is a way of showing your affection. It is something they really like to do and they will appreciate your giving them the opportunity to get out and exercise. Working dogs need a job to do. Lacking a herd of cattle or sheep, you might be able to convince your dog that the walk is an important job. And, as mentioned above, there is the play aspect. I like to start out slow, let her sniffer go wild so she gets that out of her system, then do some serious loose-leash walking for a few minutes, before stopping again to give her time to just be a dog. Along the way, I like to give her a chance to play. This morning, I brought along a Frisbee, but it could have been a ball, or a stick, or her favorite chew toy. Fortunately, in our town we have lots of places where you can stop and play. Bonding: The person who walks the dog most regularly is the one who will build the strongest bond with it. We’ll be walking along and I’ll look down at Suki and find that she is looking up at me, smiling. When I smile back, she stops and wants to jump up on me to give me a kiss. It’s like she’s saying, “Aren’t we having fun, Daddy?” And we are. Getting used to scary things: Monday is garbage collection day in our neighborhood. Perhaps nothing is scarier to a skittish 10-month old dog than a noisy garbage truck. Familiarization with scary things is another thing that can be accomplished on regular walks. Yesterday, I let her stop and watch and listen as the cans were lifted into the truck and the garbage was compacted. She didn’t bark once. The next time we encounter a Rumpke truck on our route, she will understand what it is and we can walk right on by. This morning we walked by the barky-dog house and she refused to engage in the bark-a-thon with the two dogs that live there, but she did bark at our neighbor’s dog which was out in the yard. Sometimes the progress is slow. But it’s definitely there. We walk in the morning and evening. In the morning it’s just me and the dog. In the evening, Amy comes along for a little family time. We are averaging between 90 minutes and two hours a day, sometimes more. One morning Suki and I walked for 90 minutes in the Glen on one of the lesser traveled trails. She loves to help me find the path through the undergrowth. When there’s real work to be done, she has no interest in lollygagging.